Andrew Scott lives in Indianapolis and teaches at Ball State University. His work has been published in Esquire, The Cincinnati Review, Mid-American Review, The Writers Chronicle, and Glimmer Train Stories. 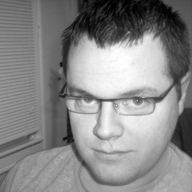 He is the co-editor of Freight Stories (www.freightstories.com), an online fiction quarterly, and author of Modern Love, a short story chapbook. The school board has booked Sherman Cadabra, the traveling hypnotist, for a Friday night engagement in the McHale High School auditorium. He is spotlighted at center stage, dressed in a tuxedo, folding chairs lined behind him. Missy bought tickets for her and Paulie after reading about the show in this morning's Courier-Gazette. She's a senior; Paulie, a lowly freshman. Paulie's wheelchair is parked in the aisle. The hypnotist's reputation—over three hundred shows per year, numerous awards, and two appearances on The Tonight Show—has preceded him, evidenced by the overwhelmingly warm response. The school board likes him because he has a low guarantee, preferring a larger take of ticket sales. In the newspaper, the superintendent claimed McHale hasn't seen an act this “universally renowned” since the Harlem Globetrotters' appearance two decades ago. “I want to meet him,” Paulie says. “I'll do what I can,” Missy tells him. She has friends in the theatre club, some of whom are working backstage tonight, fetching water for Cadabra, and one boy who's in charge of the main spotlight. Maybe she can sneak Paulie backstage. “Shh,” she says, knocking his hand away. Down in front are two sophomores from her photography class, but Missy can't find other familiar faces. The crowd seems older—parents and grandparents—or else much younger, grade school kids. Finally she glimpses a few recognizable faces: girls from various classes, boys from choir. The girls she sees have teased her before, but they're here now, same as her, on a Friday night. Aunt Laura should be glad for the night to herself. Since the car accident that killed their parents two years ago, Missy and Paulie have lived with their mother's sister, three blocks from the high school. Only Missy was unharmed in the accident, but when their aunt has phrased it that way to neighbors, it sounds cruel. She is injured differently, perhaps—not less. “It doesn't work for everyone,” he says. “Only for true believers.” He winks, and a silence drops over the crowd. Even Missy stops glancing around the room and stares at him. “So who believes?” he asks. Cadabra's volunteers descend into the crowd, one on each side of the stage. The woman on the left says, “A hypnotist's power lies in his volunteers.” A tiny microphone clipped to her dress booms her voice across the crowd. Slowly, members of the audience queue along the auditorium's side walls. Paulie's eyes dart from the stage to Missy, and then back. “It's a bad idea,” Missy says. Paulie takes a small sketchpad from the pouch sewn into the back of his wheelchair and begins to draw Cadabra. In the last year, when he hasn't been able to walk, kick soccer balls, or go long for the deep pass, Paulie has taught himself to draw. Confined to the chair, he's devoted more hours at his desk than to physical therapy. There's not much hope he'll walk again, but doctors can't rule out the possibility. The last few weeks have shown progress—his legs making a few uncontrollable twitches during his physical therapy sessions, a slight surge forward. The therapist is hopeful. Perky, their mother might have said. The assistants in white guide eight volunteers to the stage, one for each chair behind Cadabra. The first volunteer, an older man in a suit, shakes hands with Cadabra when called to the front. They talk for a minute. The old man, a Marine who served in Korea, has lived here since his return from that conflict. His favorite color is blue. The auditorium's speakers hum with a crescendo of classical music, an orchestral rush. The volunteer's consciousness drifts away. Cadabra tucks the silver rod into his tux pocket and smiles. He addresses the crowd, arms to his sides, palms out. Slowly he raises his arms above his head. “Let's remain civilized,” Cadabra says. The old man barks weakly. The crowd titters. “Sounds like a terrier,” Missy says. Again the auditorium grows heavy with delight. Paulie picks at a scab on the back of his hand. A classmate dared him to use an eraser on his skin, and Paulie had done it to impress him. “Don't make it worse,” Missy says. Cadabra thanks the first volunteer. He asks the next two volunteers, a mother and daughter, questions regarding American history. The mom doesn't know the name of the tenth president. The girl thinks Anchorage is the capital of Alaska. Neither knows whose likeness graces the ten-dollar bill. He hypnotizes the mother first, then the girl. He asks them the same questions again, but the mother says John Tyler, and the girl says Juneau. Alexander Hamilton, they both agree, is the face on the ten-dollar bill. “Blue hen chicken,” the girl states plainly. Is this hypnosis? Weird facts and trivia answers no one cares about? So what if some woman once read Encyclopedia Britannica. Where's the show? Where's the glamour? She expected powerful discoveries, secret lives, former selves, reincarnations—a French woman beheaded for love, a man of royal Egyptian descent. This is garbage, unworthy of the hocus-pocus, certainly not worth the cost of admission. Cadabra's assistants mingle in the crowd like sibling apparitions while everyone stares at the stage. The assistants remind Missy of the more popular girls in school, the whole cluster of Jennifers and Ambers and Kimberlys who make fun of her, frown on her clothes, think so little, talk so much. They put on a show, do only what makes them look good. Anything else is an accident of kindness. Some of them are in the crowd tonight. The whole group of girls might wind up assistants to sideshow freaks, she thinks. Cadabra's assistants aren't much older than Missy, perhaps twenty. One assistant finds her way to the back, and smiles when she sees Paulie. Onstage this woman in white resembles a magazine model: flawless skin, shiny blonde hair, thick lips. Only inches from her now, even hidden from the stage's lights, Missy can see a few covered pock marks on the woman's cheek, the crooked slant of her lips. “That's not a good idea,” says Missy. “Let's go,” he says to the assistant, who pushes him out the back exits. Four people are hypnotized during Paulie's absence, forty nervous minutes for Missy while the show keeps on. More music blasts from the P.A. system, inspirational “magic music,” Cadabra calls it. Finally Paulie appears onstage, pushed from a side entrance. Cadabra asks him about school, what he does for fun. Seated next to Missy, watching the show, Paulie is smooth, quick-witted, mouthy. But in front of the crowd, with the microphone less than a foot away, he becomes average. Little handicapped boy, Cadabra's people must think. Perfect for the show. Cadabra asks Paulie to stare at the silver rod. “Focus your eyes on this.” He whispers to Paulie, as with the other volunteers, but for longer. The crowd becomes restless. The audience gasps. Missy shakes her head. The front rows start chanting legs, legs—a low chant, growing louder from one row to the next, all the way to the back. The brick wall keeps the sound from escaping into the high school hallways, the voices and echoes floating above the crowd. “We ask that you remain silent,” one of the assistants says. The phrase reminds her of quieting Paulie, and only now does Missy think of herself as his assistant. When the crowd noise dies down, Cadabra says the word, and Paulie grips the arms of his chair. Slowly, he pushes himself up. One deliberate, paced step precedes another, until he's taken four steps. Missy can't stand to watch. Part of her doesn't want to see this trick, whatever Cadabra has done to win over the audience. But she does watch. She has known two Paulies: before and after the accident. This is a third way. She remembers playing Frisbee with him and their parents, tackling him hard in a game of football, his sly grin at the grass stains from chin to knee. He'd played baseball. Their mother had cried when the ball bounced up and popped him in the face. Paulie had grinned with a fat lip, revealing the missing tooth. Wherever Missy went, Paulie trailed behind on his bicycle, pedaling after her for hours. Sometimes their mother made him stay home. “Missy needs time with her friends,” she'd said to him. Though now, Missy wants time with that Paulie, the one from the past. The one who could use his legs. Forget her friends. Most of them stopped coming around after the accident. Not all at once, but gradually, shirking away from the awkward silences and discomfort. Helping Paulie, getting through—the trick is to imagine a good ending each day and try to pull it off. Paulie teeters, then balances himself and takes the final three steps to Cadabra, who steadies the boy. One assistant pushes Paulie's wheelchair across the stage. She and Cadabra help Paulie sit down. The volunteers do not seem changed upon waking to the crowd's vacant eyes and open mouths. But they look around, taking in their surroundings. Paulie stares into the lights, then to the back of the crowd. Missy wants to wave to him, but he's too far away. Missy pushes through the crowd, out the back exit, where Cadabra and the assistants are already seated behind a portable cafeteria table stacked high with copies of his book, What You've Forgotten. The cover features a medical drawing of the brain labeled in smaller sections. Dreams, memories, former lives. In her former life, Missy had a mom and dad, a brother who could walk, and less guilt. Her memories of that time remind her every day. In her dreams it hasn't happened yet. Out in the hallway, familiar faces begin to appear. Girls from classes, boys she's gone to school with since grade school, teachers; family friends; men and women who worked with her parents. How did she miss them? They all want to say hello, to ask how Paulie's been, to gape and wonder at his magnificent act. The girls ask what she's doing tomorrow. She decides to not answer their calls. She maintains the civil routine and excuses herself. She needs to grab Paulie and get out of here. He must still be backstage. Down the music and theatre wing are more people she knows. She pushes past them, back to the far corridor. And, sure enough, there's Paulie, sitting by himself in the shadows. “I've never been backstage before,” says Paulie. It's the first time she's used home to refer to their aunt's house, a fact not lost on Paulie. “That's not home,” he says. The air tonight is cool but not cold. What to say to him? He still misses kickball during P.E. class, the exhilaration of running downhill, pedaling a bicycle. The truth would simply break his heart. “He made you name the moons of Saturn,” she says. Missy glances up at the only moon she knows, now a fingernail clipping pasted above the earth. The clouds' gray blanket hangs heavy against the dark sky. “But I already know that stuff,” Paulie says, turning toward doubt. He fingers the buttons of his shirt with his scabbed hand. She should tell him he walked across the stage, seven brave steps, his muscles' memories of movement. She should say something seemingly real happened there, an event she doesn't know how to explain. But won't it frustrate him more to know he walked across the stage but must now remain in the chair, unable to even remember? At next week's therapy Paulie might show progress. Maybe he will walk again. She shouldn't get her hopes up. Already the lie will haunt her. Hundreds of people witnessed his walk. Some classmate or teacher will tell Paulie about it on Monday, making tonight another moment she'll be unable to forget.